Broadway, the 'Jewel of the Cotswolds' is surely one of the prettiest villages in England . Approached from Oxford, the road arrives at a steep escarpment to reveal the vast panorama of the The Vale of Evesham. At the base of the descent is The Broadway Hotel, a striking 16th century building of half stone half timber set back on the village green. Formerly a retreat for the Abbots of Pershore, it still has an aura of tranquillity, though monastic privations have given way to the sinful luxuries and comforts expected by today's travellers. It has all the low-beamed, mellow Cotswold charm of a traditional inn with attractive, modern fabrics and furnishings. The Country Bar, with its double height ceiling over looked by the Minstrels Gallery, draws in guest and locals alike and is a great spot for an exchange of news and views. Tattersalls Brasserie features a tantalising menu, with seasonal dishes made from local produce from the Vale of Evesham and the surrounding Cotswolds. 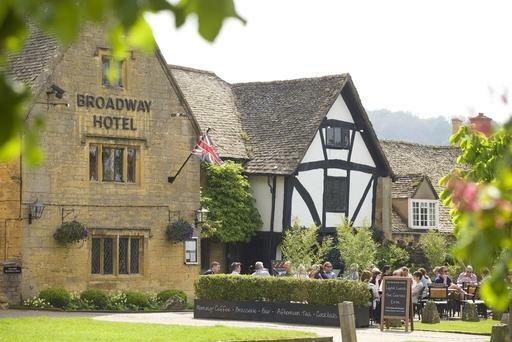 A wonderful place to be at any time of year, The Broadway Hotel is ideally placed for visiting historic sites, the many beautiful golf courses in the rolling Cotswold countryside, inspirational gardens or for a trip to the races at Cheltenham or Warwick.